People make places; this workshop develops students understanding of a sense of community home and comfort. Together we untangle who our people are, what they do, where they may live, and how they contribute to urban, rural and city communities. We use critical thinking, inquiry based collaborative investigation and drama. Grades 3-5: We will have deeper discussions around family, memorials and urban shifts. 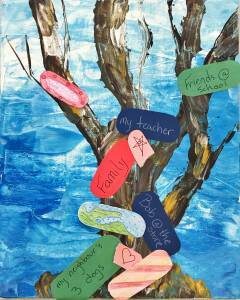 In the studio: experiment with an assortment of painting, drawing and collage techniques to create their own graffiti tree, which communicates a sense of belonging & identity.